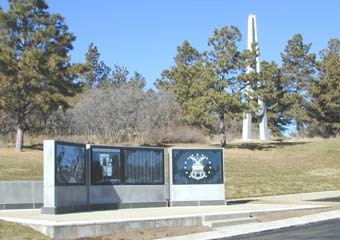 The U.S. Air Force Academy Cemetery is located on the grounds of the Academy. It can be reached by exiting Interstate 25 at the north entrance to the Academy and proceeding west past the guard post, continuing approximately one-half mile to Stadium Way. After turning south on this road, proceed a short distance to Parade Loop and turn west, continuing 0.4 mile. 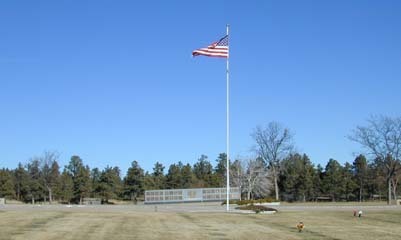 The cemetery is on the north side of the road. According to GPS-derived geolocation (accurate to within 10 meters), the cemetery's coordinates are 39°00'55.1"N and 104°51'17.8"W. The cemetery was established September 22, 1958 and the first burial was Lt. Gen. Hubert R. Harmon (first superintendent of the Academy) on Sept. 28, 1958. Point of contact for the cemetery is the Mortuary Affairs Office at (719) 333-3323. Note: The directory board located on the grounds of the cemetery had numerous errors at the time of publication of this index (summer 1997). The mistakes are recorded as discrepancies in the database; however, the Academy Mortuary Affairs Office was notified of these errors and planed to correct the directory board as soon as possible.